TL; DR: The marketing team behind the Milwaukee Bucks needed to understand where prospective ticket holders engaged online and to automate its messaging, so the franchise turned to Marketo and its Engagement Platform. Built specifically for marketers, Marketo’s technology allowed the Bucks to harness relevant native and third-party data and turn it into behavioral profiles its marketers used to drive highly interested leads to its sales department. Season tickets are expensive, and selling them is not always easy, but by using Marketo’s platform, the Bucks have improved the sales teams’ success rate. Selling season tickets for an NBA franchise is no easy task. After all, it’s an investment that can cost fans thousands of dollars to attend the 41 regular-season games that are played in home stadiums. The Milwaukee Bucks franchise has a history of great players, including Kareem Abdul-Jabbar, Oscar Robertson, and Ray Allen, but those superstar players aren’t around to put fans in the seats anymore. However, the modern incarnation of the Bucks does have its selling points. Namely, superstar Giannis Antetokounmpo, a new arena in the 2018-19 season, and a robust software platform that’s empowering its marketing and sales departments to deliver personalized messages to the team’s thousands of fans in Wisconsin and beyond. While the Bucks are known as one of the NBA’s most exciting young teams, its previous marketing software platform was quickly becoming outdated. Modern marketing platforms are able to harness the power of big data and machine learning to automate many of the processes that drive sales, and that’s exactly what the NBA team was able to take advantage of with Marketo and its popular Engagement Platform. To help shed light on this partnership and how modern marketing software functions, we recently spoke with Brian Glover, Principal Product Marketing Manager at Marketo, and Ben Conrad, Director of Database Marketing for the Milwaukee Bucks. Marketo has given the Milwaukee Bucks’ marketing team the ability to automate processes to drive sales. Marketo’s ease of use and ability to automate processes based on data from native and partner channels, including email, social media, and web browsing, were key factors in the Bucks choosing the California-based software company as a provider. Since making the switch, the Bucks have seen higher open rates and conversions thanks to the personalized messaging made possible by Marketo. Despite being an NBA franchise, the Bucks’ marketing team doesn’t have unlimited marketing resources. This is why it was important for Ben and the marketing department to set up stage campaigns and automate marketing processes through Marketo’s Engagement Platform. The platform combines data from a wide range of channels, which helps marketing teams speak to customers in a unified voice with personalized messages delivered at the ideal time. Brian told us this type of automation requires speed and scale, as well as the proper data. Marketo enables the creation of behavioral profiles that help marketers understand who they’re speaking to. 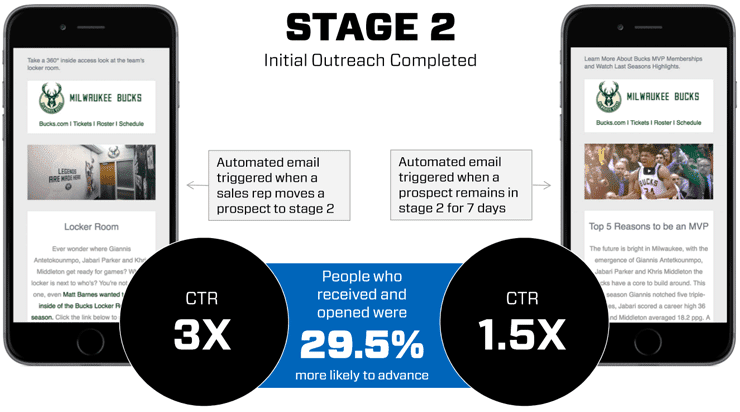 Using Marketo to automate emails triggered more prospects to move further down the Bucks’ funnel. Through email marketing automation, social media integrations, and web tracking, the Bucks are already seeing tangible benefits. Like every other NBA franchise, web tracking was a crucial piece for the Bucks, which sells tickets and merchandise through their partner sites, Ticketmaster and Fanatics. 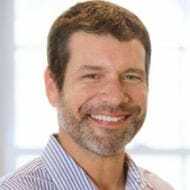 “We needed web tracking where our customers are transacting in addition to Bucks.com so we could set up email automations based on the behavior of our fans and customers,” Ben said. Ben told us the Bucks started seeing immediate benefits after switching to Marketo. The franchise underwent a rebrand in 2015, and the marketing team was able to create and embed web forms to invite fans to the first-annual Bucks summer block party, where new uniforms were unveiled. It provided the Bucks a clean way for customers to RSVP for the event while the email automation provided immediate marketing opportunities. This messaging also included season ticket information, where if fans clicked a ticket link, it would trigger automation events in the team’s CRM that enabled sales reps to call interested fans about ticket packages. A strength of Marketo’s software is its vast integrated ecosystem of more than 650 partners that pulls in relevant data to give marketers the ability to understand customers. The Bucks were especially excited about Marketo’s Ad Bridge, which was tightly integrated with Facebook Lead Ads. Ben told us the Bucks had been using social media advertising for season tickets but weren’t getting the kind of results they were looking for. Marketo integrates with Facebook Lead Ads to trigger processes that led to sales reps calling prospects. 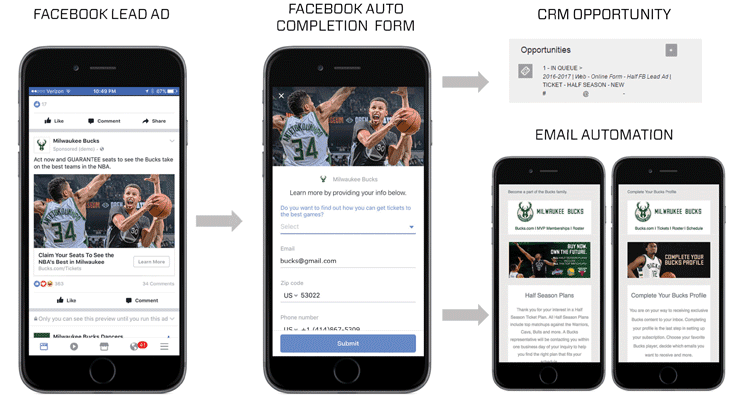 Thanks to an integration with the Bucks’ CRM, Microsoft Dynamics, the marketing team created an automation that alerted sales reps to call a customer within an hour of them showing interest in tickets after entering their information off the Facebook Lead Ad. Marketo has given the Milwaukee Bucks’ marketing and sales teams the tools to drive conversions through personalized, timely messages based on behavioral profiles. Ben and his team can now discover new customers based on insights, and automation actions make it easier to reach more fans. Since making the switch to Marketo, the Bucks’ marketers are delivering high-quality leads to the sales department using creative digital messaging. After all, it’s much easier to sell to people who are already interested. Recent marketing efforts have included sending qualified customers emails with an embedded video that promises a guided tour of the stadium currently under construction for those who buy season tickets off that link. Ben says the next step with Marketo is integrating with the team’s mobile app to further reach out to prospective customers.